Allosteric ribozymes (aptazymes) that have extraordinary activation parameters have been generated in vitro by design and selection. For example, hammerhead and ligase ribozymes that are activated by small organic effectors and protein effectors have been selected from random sequence pools appended to extant ribozymes. Many ribozymes, especially self-splicing introns, are known control gene regulation or viral replication in vivo. We attempted to generate Group I self-splicing introns that were activated by a small organic effector, theophylline, and to show that such Group I aptazymes could mediate theophylline-dependent splicing in vivo. By appending aptamers to the Group I self-splicing intron, we have generated a Group I aptazyme whose in vivo splicing is controlled by exogenously added small molecules. Substantial differences in gene regulation could be observed with compounds that differed by as little as a single methyl group. The effector-specificity of the Group I aptazyme could be rationally engineered for new effector molecules. Group I aptazymes may find applications as genetic regulatory switches for generating conditional knockouts at the level of mRNA or for developing economically viable gene therapies. Ribozymes whose activities are modulated by effector molecules have previously been engineered. For example, Herschlag and co-workers have previously shown that a nucleobase could complement an abasic site within the hammerhead ribozyme, restoring cleavage activity . Similarly, Porta and Lizardi engineered a hammerhead ribozyme that assumed an inactive secondary structure; upon the addition of an oligonucleotide that disrupted the engineered secondary structure, the ribozyme was activated . More recently, it has previously been shown that many selected nucleic acid binding species (aptamers) undergo conformational changes upon ligand binding [3–6] In addition, when aptamers are conjoined to ribozymes, the ligand-induced conformational changes in the aptamers frequently modulate the structures and hence the activities of the ribozymes [7–9] For example, binding of theophylline to the anti-theophylline aptamer  modulates the conformation of residue [11, 12] and the overall stability of the aptamer [10, 13]. Appending the anti-theophylline aptamer to the hammerhead ribozyme allowed cleavage activity to be modulated by 110-fold by theophylline . Similarly, appending the anti-theophylline aptamer to a small ribozyme ligase (L1) generated an aptazyme that was activated 1,600-fold by saturating theophylline concentrations . The methods for engineering and selecting Group I aptazymes appear to be generalizable to several different types of ribozymes. Adjoining aptamers to the Group I self-splicing intron would potentially allow the control of splicing not only in vitro, but in vivo. To this end, we have attempted to generate and assay Group I aptazymes. In order to convert the Group I self-splicing intron to a regulatable aptazyme, it was necessary to first identify sequences or structures in the ribozyme whose conformation might modulate splicing activity. The structural and kinetic properties of the Group I self-splicing intron from the thymidylate synthase (td) gene in bacteriophage T4 have been extensively studied. In particular, a series of nested deletions of the P6 stem-loop have been shown to partially or completely compromise ribozyme activity . More importantly, either magnesium or the tyrosyl tRNA synthetase from Neurospora mitochondria (CYT18) can suppress many of these defects [16, 17]. Previous studies with other introns have also revealed that deletion of the P5 stem-loop can modulate ribozyme activity [18, 19]. We hypothesized that sites where deletions modulated ribozyme activity might also prove to be sites where aptamer conformational changes would modulate ribozyme activity. Based on these studies, we designed a series of Group I aptazymes in which the anti-theophylline aptamer was substituted for either a portion of P6 or P5 (Figure 1). The anti-theophylline aptamer was attached at the same point as had previously proven successful in the design of theophylline-dependent cleavases and ligases [13, 14]. Theophylline-dependent td group I intron constructs. a) The figure shows the predicted secondary structure and tertiary interactions of the 265 nt deletion construct[15, 41] of the td intron drawn in the format of Cech et al. (1994) The intron is in uppercase and the exons are in lower case letters. The 5' and 3' splice sites are indicated by arrows. The P4-P6 domain is boxed. b) The B11 construct was based on the Δ 85–863 deletion mutant of the td intron which showed no activity in vivo or at low Mg2+ (3 mM) in vitro. An anti-theophylline aptamer, highlighted in gray, was substituted for the P6a stem of the intron in constructs Th1P6, Th2P6, Th3P6, Th4P6, Th5P6 and Th6P6, and for the P5 stem in constructs Th1P5 and Th2P5. Mutations in the anti-theophylline aptamer are boxed in black for constructs MeX2P6 and Th2P6.D. The C-to-A mutation in MeX2P6 changes specificity from theophylline to 3-methylxanthine . The A-to-U and C-to-U mutations in Th2P6.D abolish theophylline-binding [11, 43]. The self-splicing activities of the Group I aptazymes were examined in vitro using a standard splicing assay (Table 1). Magnesium had previously been shown to suppress structural defects in the td intron, and ligand-induced suppressions of splicing defects were examined by carrying out splicing reactions at either low (3 mM, stringent) or high (8 mM, permissive) magnesium concentrations . Several of the constructs were either relatively inactive (e.g., Th3P6, Th5P6, and Th6P6) or did not consistently show differential splicing activity (e.g., Th4P6 and Th2P5). However, four of the constructs, Th1P6, Th2P6, Th3P6, and Th1P5, showed good activity (>10% of wild-type) and increased self-splicing in the presence of theophylline. For example, Th2P6 showed the greatest activation (8-fold at 8 mM MgCl2), while Th1P5 showed low activation (1.2-fold) at both magnesium concentrations. Relative in vitro splicing activity of constructs containing anti-theophylline aptamers. Extent of reaction is relative to the parental construct in 3 mM MgCl2 with no theophylline at 2 hrs. For all of the aptazymes except Th3P6, the ligand-induced splicing activity was greater in a standard assay at the more stringent (3 mM) magnesium concentration (Table 1). The construct Th3P6 was inactive at lower magnesium concentrations, but underwent ligand-induced splicing at the more permissive concentration (8 mM). Interestingly, those aptazyme constructs that showed ligand-dependent activity closely resembled the original deletion variants that showed magnesium-dependent recovery of splicing activity. For example, the junction between the aptamer and the Group I ribozyme in the aptazyme Th2P6 resembled the deletion variant td ΔP6-6; the aptazyme was activated by theophylline, while the splicing defect of the deletion variant at 3 mM magnesium was suppressed by 8 mM magnesium or by stabilization of a tetraloop sequence that capped the P6 helix . Defects that poise a ribozyme between active and inactive conformers have previously been used to engineer effector-dependence . The kinetics of splicing of two of the most activated variants, Th1P5 and Th2P6, were examined in the presence and absence of theophylline (Figure 2). As in the single point assays, the theophylline-dependence of the engineered introns was readily apparent (Figure 2a). The time courses reveal that the extents of splicing of the aptazymes were significantly affected by the addition of theophylline (Figures 2b,2c). The aptazyme modified at P5 (Th1P5) showed less theophylline-dependent enhancement of the extent of reaction than the aptazyme modified at P6 (Th2P6), consistent with the single point assays described above. Th1P5 was activated 1.4-fold at 15 minutes (Figure 2b), while Th2P6 showed a 4.0-fold rate enhancement at 15 minutes (Figure 2c). These levels of ligand-dependent activation were similar to those observed with the original hammerhead aptazyme constructs, and it may prove possible to use in vitro selection to further optimize activation [13, 14]. However, when the time course data were fit with a single exponential equation, the rates of the initial reactions turned out to be very similar in both the presence and absence of theophylline (Table 2). In vitro activation of td group I aptazymes by theophylline. a) Autoradiogram showing the splicing activity of the parental, B11, Th1P6, Th2P6 and Th1P5 intron constructs in the presence and absence of 1.5 mM theophylline. LI, linear intron; CI, circular intron; E1–E2, exon 1–exon 2 ligation product; Crp, cryptic ligation product; pre-mRNA, unspliced mRNA. 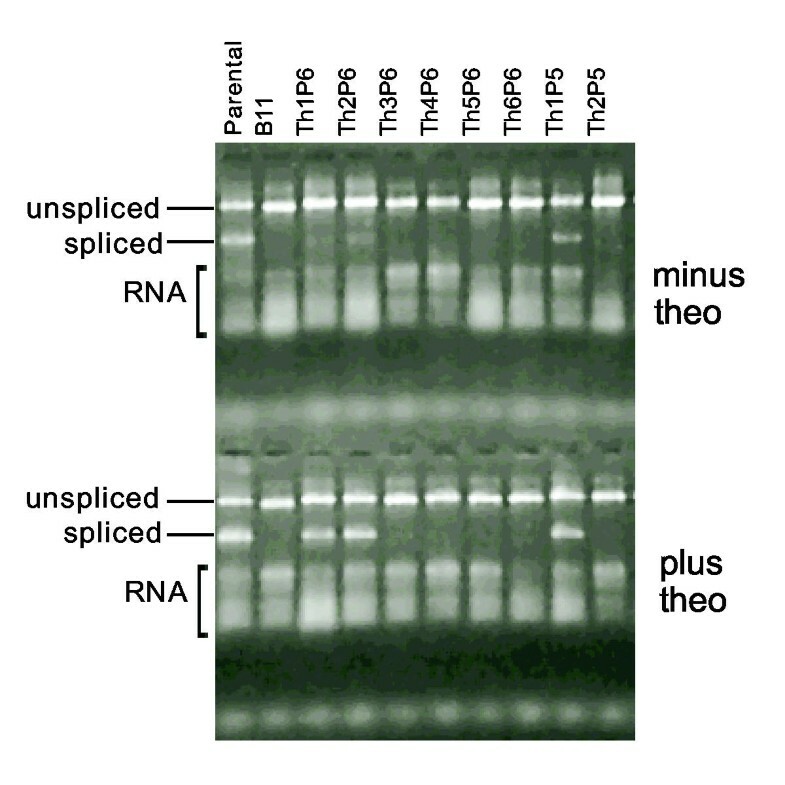 b) Kinetics of splicing for Th1P5. c) Kinetics of splicing for Th2P6. For both figures, solid circles represent the reaction in the presence of 1.5 mM theophylline and open circles represent the reaction in the absence of theophylline. Data points are the average of four determinations. Kinetic rate constants for constructs containing anti-theophylline aptamers. Rate constants were calculated based on the data shown in Figures 2b and 2c, and the equations presented in Methods. Based on these results, the primary mechanism of activation is likely the same as has been observed for other aptazymes: ligand-induced conformational changes that stabilize functional ribozyme sequences and structures. However, the Group I self-splicing intron is a much more complicated ribozyme than either the hammerhead or the L1 ligase; for example, the tertiary structure of the Group I intron is established by a complicated folding pathway. [22–26] Therefore, it was possible that theophylline-binding influenced the overall folding pathway of the engineered Group I aptazyme. In order to assess this possibility we examined the theophylline-dependence of Th2P6 splicing reactions in vitro following prolonged incubation (30 minutes) to allow for re-folding. No significant change in the extent of ligand-dependent activation was observed following pre-incubation (data not shown). These results argue that both GTP and theophylline may need to be present to influence the folding pathway of the engineered Group I aptazymes. These results are also consistent with previous physical and kinetic [28–30] data that shows that the folding of the Group I intron is dependent in part upon GTP. Each of the successful aptazyme constructs was subsequently cloned into an interrupted thymidylate synthase gene in place of the parental td self-splicing intron. The vectors were introduced into an E. coli strain (C600ThyA::KanR) that lacked a functional thymidylate synthase gene and that was a thymidine auxotroph. 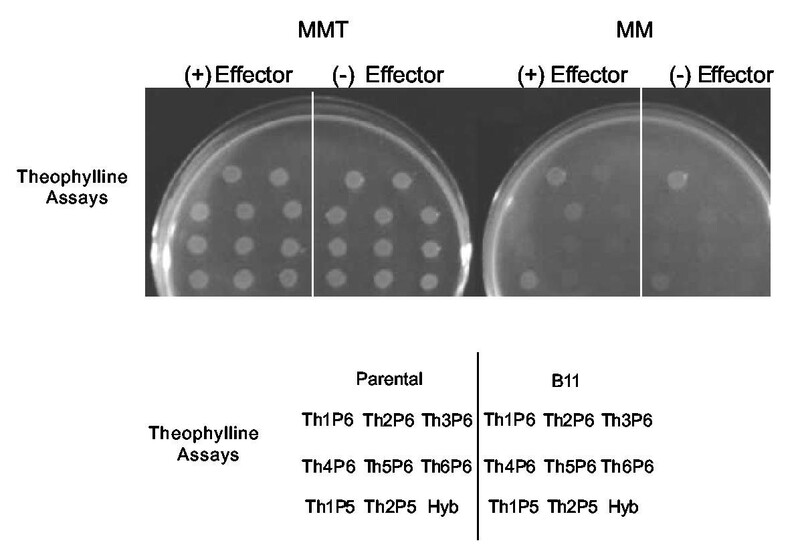 When bacteria grown in rich media were subsequently plated on minimal media lacking thymidine, no colony growth was observed with the exception of Th1P5. However, when theophylline (7.5 mM) was included in the minimal media, bacteria containing the intron Th2P6 formed colonies, and bacteria containing the intron Th1P5 showed increased growth (Figure 3). All introns that originally showed no or low splicing in vitro (including Th3P6) could not rescue bacteria either in the presence or absence of theophylline. Finally, no growth was observed in a negative control that contained a non-functional Group I intron (B11), and no theophylline-dependent changes in growth were observed in a negative control in which mutations were introduced into the aptazyme to abolish theophylline binding (Th2P6.D). Interestingly, no growth was observed for bacteria harboring the intron Th1P6, despite the fact that this aptazyme showed the greatest activation by theophylline in vitro. The plating results were consistent and reproducible over a variety of experiments. In vivo splicing activity. The parental, B11 and theophylline constructs were spotted in the presence and absence of 7.5 mM theophylline on minimal media (MM). To better characterize the influence of the effector on intron-splicing, we also carried out a series of growth experiments in liquid culture (Figure 4a). 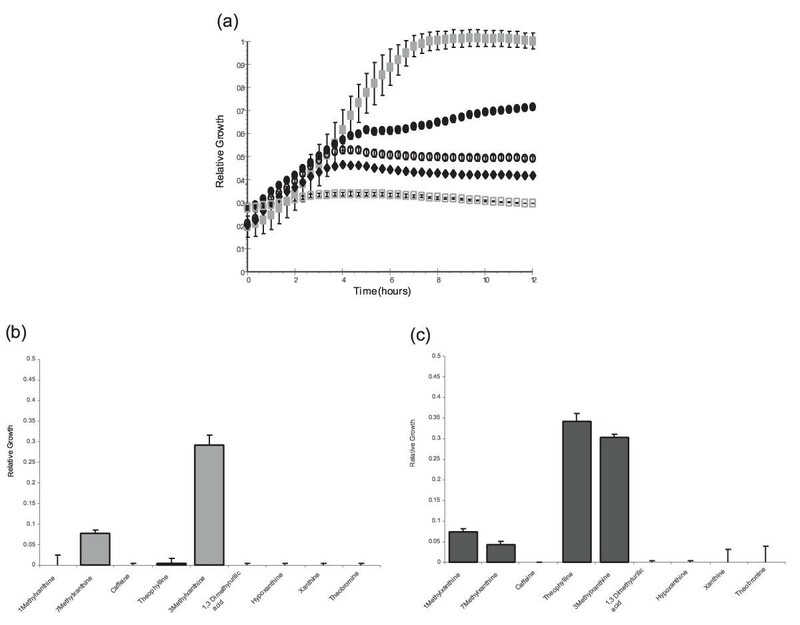 An overnight bacterial culture that contained the td gene divided by the aptazyme Th2P6 was inoculated into fresh, minimal media, effector was added, and growth was continuously monitored. As expected based on growth assays on solid media, little growth was observed in the absence of theophylline. 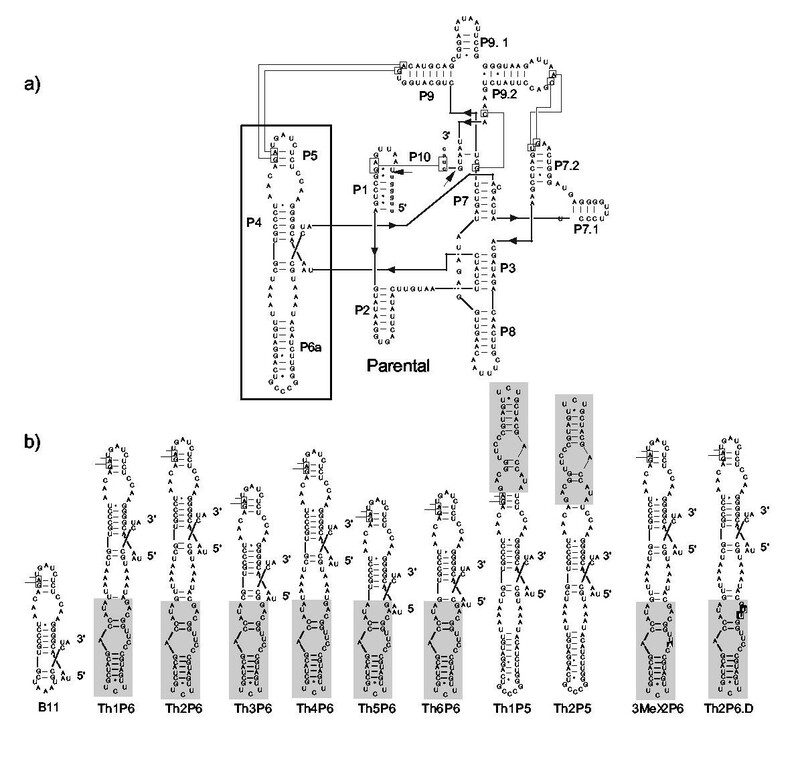 However, when theophylline (0.5 mM) was added to liquid medium, bacteria grew almost as well as a control in which the parental intron was inserted into the td gene. Most importantly, bacterial growth was not activated by the structurally-related effector caffeine (i.e., 7-methyltheophylline); the anti-theophylline aptamer is known to discriminate between caffeine and theophylline by a factor of 10,000-fold . No effector-dependent growth differences were observed with cultures containing td genes divided by the non-functional Group I intron B11. Similar results were obtained with cultures that contained the td gene divided by the aptazyme Th1P5 (Figure 4b). However, in this instance there was some background growth of uninduced bacteria, consistent with the higher level of background splicing activity in vitro. If theophylline is regulating intron splicing in vivo, then the extent of bacterial growth should be dependent upon the concentration of theophylline introduced into the media (Figure 4c). However, theophylline was toxic to bacteria, and caused a decrease in the growth of bacteria containing the parental td intron at concentrations greater than 0.5 mM. Consistent with this observation, low concentrations of theophylline progressively increased bacterial growth (by activating the td intron) while concentrations of theophylline above 2 mM progressively decreased bacterial growth (although levels of growth were still well above background). Theophylline-dependent growth. Relative growth curves are shown for C600:ThyA cells containing either Th2P6 (a) and Th1P5 (b) in the presence (black filled circles) and absence (black open circles) of 0.5 mM theophylline or 0.5 mM caffeine (black diamonds). Parental (grey filled squares) and B11 (grey open squares) controls were grown in the 0.5 mM theophylline for comparison. Plots are standardized to the extent of growth of cells containing the parental intron. Each point represents the average of three replicate growth curves. 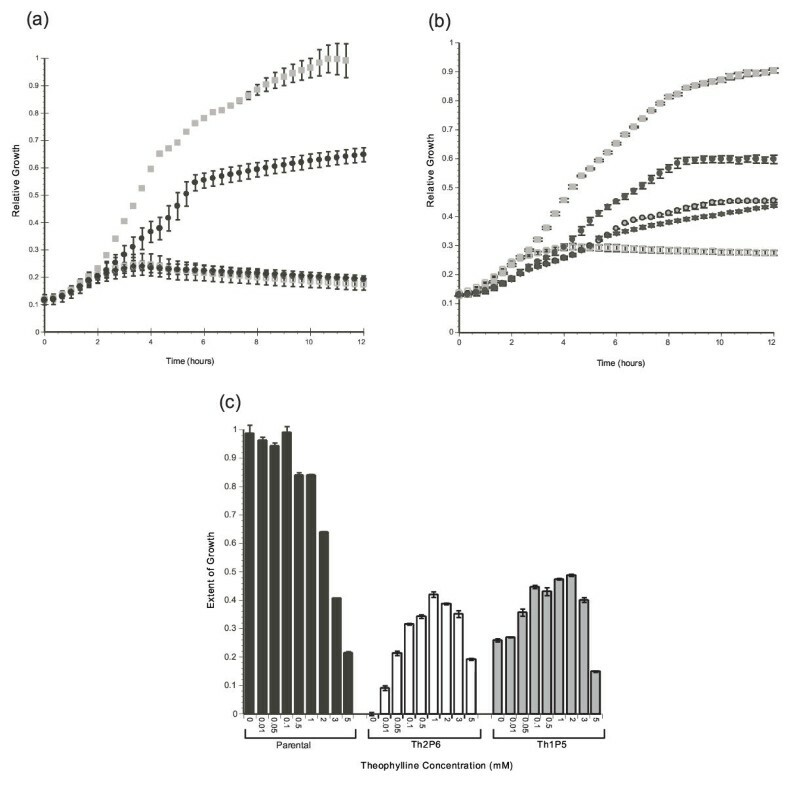 c) Extent of growth at 12 hours for parental, Th2P6 and Th1P5 introns over a range of theophylline concentrations. Background growth (B11) has been subtracted, and results are standardized to parental growth with no theophylline. These results were all consistent with the hypothesis that theophylline regulates intron splicing in vivo. 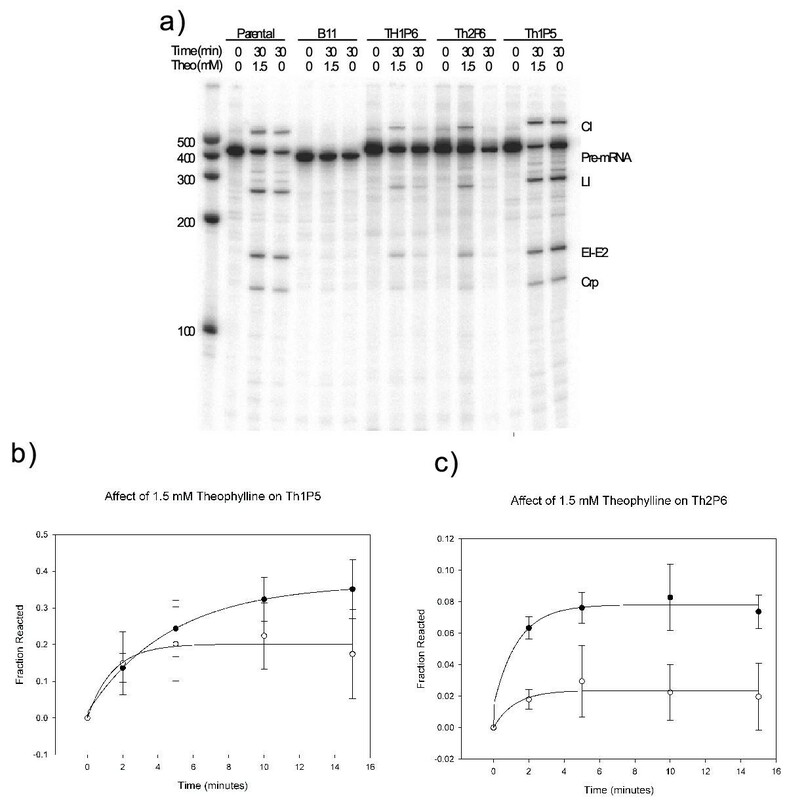 To further probe whether this was in fact the case mRNA was isolated from E. coli treated with theophylline or not, and RT-PCR was used to confirm the presence of spliced introns (Figure 5). For each of the introns known to be responsive to theophylline in vivo (Th2P6 and Th1P5) an increase in spliced mRNA was observed, while most other introns that were not responsive to theophylline in vivo did not show an increase in the levels of spliced mRNA. An exception to this was Th1P6, which originally showed theophylline-dependent splicing in vitro and also showed theophylline-dependent splicing in vivo. However, Th1P6 did not mediate theophylline-dependent growth. The bacterial mRNAs were extracted, cloned, and sequenced, and half of them appeared to use a cryptic splice site. RT-PCR analysis of whole cell RNA. 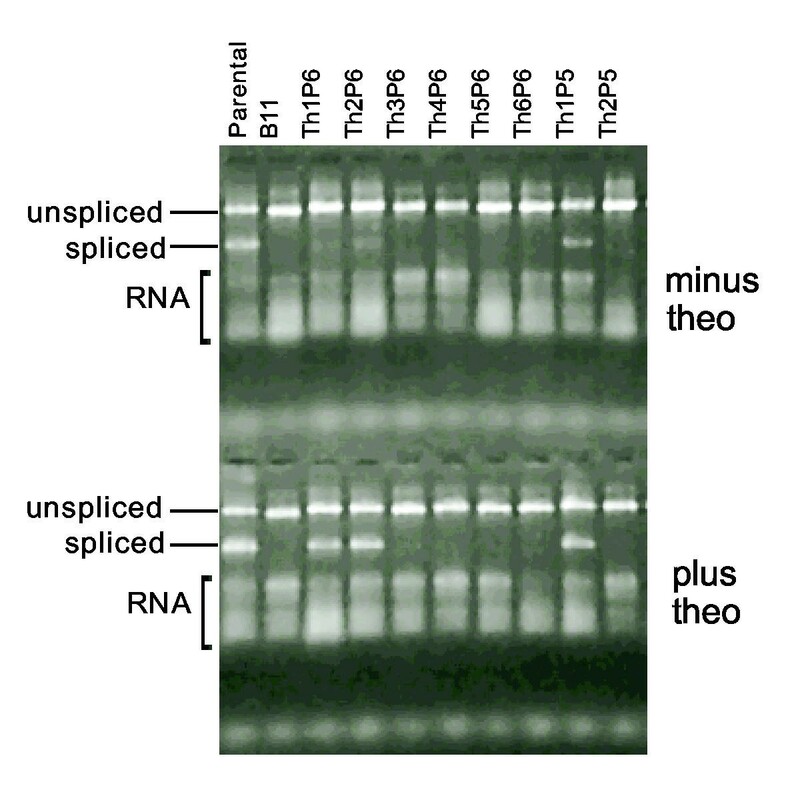 Bands corresponding to spliced and unspliced mRNAs are indicated. The upper set of RT-PCR reactions was seeded with RNA from cells grown in the absence of theophylline. The lower set was seeded with RNA from cells grown in the presence of 0.5 mM theophylline. Several discrepancies were noted between intron activation in vitro and effector-dependent growth. This is not surprising; other studies have revealed that there is often little correlation between ribozyme activity in vitro and in vivo . However, since it is known that relatively small changes in gene expression can greatly affect the metabolism of an organism, another possible explanation for the apparent discrepancies is that relatively small modulations in intron splicing are amplified via cellular metabolism to yield growth phenotypes. This would seem especially true in the current set of experiments, since the modulation of Thymidylate Synthase expression is known to greatly affect thymidine levels and cell growth . For example, E. coli that are starved for thymine quickly die, a phenomenon known as 'thymineless death' . In this respect, Group I aptazymes that may have yielded lower amounts of functional Thymidylate Synthase (e.g., Th3P6, which was less active than Th2P6; or Th1P6, which mis-spliced) did not allow bacterial growth. In contrast, aptazymes that may have yielded even modestly greater amounts of functional Thymidylate Synthase (e.g., Th1P5, which was both highly active and modestly activated in vitro) allowed bacterial growth. In order to examine effector-specificity in vivo, a new series of Group I aptazymes was constructed in which the anti-theophylline aptamer was mutated to bind 3-methylxanthine (3MeX2P6) . These variants proved to be responsive to 3-methylxanthine both in vitro and in vivo (Figure 6a). However, the variants were no longer responsive to theophylline, nor were they responsive to a variety of other analogues, including caffeine, 1-methylxanthine, 7-methylxanthine, 1,3-dimethyl urilic acid, hypoxanthine, xanthine, and theobromine (Figure 6b). In contrast, the original aptamer was known to also bind 3-methylxanthine, and the original Group I aptazyme (Th2P6) also proved to be responsive to 3-methylxanthine in vivo (Figure 6c). Thus, the responsivity of the aptazymes in vivo appears to mirror their effector specificity in vitro. 3-Methylxanthine dependent growth. a) Relative growth curves are shown for C600:ThyA cells containing 3MeX2P6 in the presence (black filled circles) and absence (black open circles) of 1 mM 3-methlyxanthine or 1 mM theophylline (black diamonds). Parental (grey filled squares) and B11 (grey open squares) controls were also grown in 1 mM 3-methylxanthine. Plots are standardized to the extent of growth of cells containing the parental intron. Each point represents the average of three replicate growth curves. b) Specificity of growth of 3MeX2P6 on theophylline analogs. Background growth (B11) has been subtracted, and results are standardized to parental growth on minimal media at 12 hrs. Negative values were not greater than -0.05, and were set to zero. Each analog was present in the media at 0.5 mM. c) Specificity of growth of Th2P6 on theophylline analogs. Presentation of the data is the same as in Figure 6b. Each analog was present in the media at 0.5 mM. Group I aptazymes that were dependent upon theophylline both in vitro and in vivo were engineered by conjoining the thymidylate synthase (td) intron with an anti-theophylline aptamer. Although the in vitro activation of splicing was modest (up to an 18-fold change in initial rate), this change was more than enough to mediate the survival of a thymidine-dependent E. coli strain. The ligand specificity of the anti-theophylline aptamer carried over to the theophylline-dependent aptazyme, and no activation was seen with caffeine, which differed by a single methyl group from theophylline. The effector specificity could be rationally changed by changing the specificity of the conjoined aptamer: when a mutation was introduced into the anti-theophylline aptamer that led to discrimination against theophylline and in favor of 3-methylxanthine (that also differed from theophylline by a single methyl group), the aptamer became solely responsive to 3-methylxanthine in vivo. Group I aptazymes may have a number of important biotechnology applications, including use as in vivo, real-time reporters and as regulatable gene therapeutics. E. coli strain C600ThyA::KanR was used for the plate assays and in vivo growth curves. INVaF' (Invitrogen, Carlsbad, CA) was used for cloning and plasmid amplification. Bacterial starter cultures were grown in LB supplemented with thymine (50 mg/l). Screening for thymidine auxotrophy was done in minimal media supplemented with 0.1% Norit A-treated casamino acids (MM) and MM supplemented with thymine (50 mg/l) (MMT). Plates contained Bacto agar (1.5%). Ampicillin (50 mg/l) and kanamycin (100 mg/l) were added to all growth media. The wild type plasmid pTZtd1304  contains a fully functional 265 nt derivative of the 1016 nt wild type intron . This derivative also contains the substitutions U34A, which introduces a SpeI site, and U976G, which introduces an EcoRI site. The constructs were made using standard solid phase DNA synthesis, then were PCR-amplified and cloned into pTZtd1304. The parental P6 aptazyme construct was generated by two overlapping oligos, Gp1Wt2 Gp1Wt2.122 (GCC TGA GTA TAA GGT GAC TTA TAC TTG TAA TCT ATC TAA ACG GGG AAC CTC TCT AGT AGA CAA TCC CGT GCT AAA TTG TAG GAC TGC CCG GGT TCT ACA TAA ATG CCT AAC GAC TAT CCC TT) and Gp1Wt3.129 (TAA TCT TAC CCC GGA ATT ATA TCC AGC TGC ATG TCA CCA TGC AGA GCA GAC TAT ATC TCC AAC TTG TTA AAG CAA GTT GTC TAT CGT TTC GAG TCA CTT GAC CCT ACT CCC CAA AGG GAT AGT CGT TAG). These oligonucleotides (100 pmole) were annealed and extended with AMV reverse transcriptase (Amersham Pharmacia Biotech, Piscataway, NJ; 45 units) in AMV RT buffer (50 mM Tris-HCl, pH 8.3, 8 mM MgCl2, 50 mM NaCl, 1 mM DTT) and dNTPS (200 μM) for 30 minutes at 37°C. The resulting double-stranded DNA was diluted 1:50 and amplified using primers SpeI.24 (TTA TAC TAG TAA TCT ATC TAA ACG; 0.4 μM) and EcoRI.24 (CCC GGA ATT CTA TCC AGC TGC ATG; 0.4 μM) in PCR buffer (10 mM Tris-HCl, pH 8.3, 50 mM KCl, 1.5 mM MgCl2, 0.1% Triton X-100, 0.005% gelatin), dNTPS (200 μM) and Taq DNA polymerase (Promega, Madison, WI; 1.5 units). The reactions were thermocycled 15 times at 94°C for 30 seconds, 45°C for 30 seconds, 72°C for 1 minute and then purified with a QIAquick PCR purification kit (Qiagen, Valencia, CA). The PCR product was digested with SpeI (New England Biolabs, Beverly, MA; 20 units) and EcoRI (50 units) in buffer (50 mM NaCl, 100 mM Tris-HCl, pH 7.5, 10 mM MgCl2, 0.025% Triton X-100, 100 μg/ml BSA) at 37°C for 60 minutes, purified, and cloned into SpeI/EcoRI digested pTZtd1304. The negative control and aptazyme constructs were made as described except that Gp1Wt3.129 was replaced with oligonucleotides of the appropriate sequence: B11 GCC TGA GTA TAA GGT GAC TTA TAC TTG TAA TCT ATC TAA ACG GGG AAC CTC TCT AGT AGA CAA TCC CGT GCT AAA TGC CTA ACG ACT ATC CCT T, Th1P6 GCC TGA GTA TAA GGT GAC TTA TAC TTG TAA TCT ATC TAA ACG GGG AAC CTC TCT AGT AGA CAA TCC CGT GCT AAA TTA TAC CAG CAT CGT CTT GAT GCC CTT GGC AGA TAA ATG CCT AAC GAC TAT CCC TT, Th2P6 GCC TGA GTA TAA GGT GAC TTA TAC TTG TAA TCT ATC TAA ACG GGG AAC CTC TCT AGT AGA CAA TCC CGT GCT AAA TTG ATA CCA GCA TCG TCT TGA TGC CCT TGG CAG CAT AAA TGC CTA ACG ACT ATC CCT T, Th3P6 GCC TGA GTA TAA GGT GAC TTA TAC TTG TAA TCT ATC TAA ACG GGG AAC CTC TCT AGT AGA CAA TCC CGT GCA TAC CAG CAT CGT CTT GAT GCC CTT GGC AGG CCT AAC GAC TAT CCC TT, Th4P6 GCC TGA GTA TAA GGT GAC TTA TAC TTG TAA TCT ATC TAA ACG GGG AAC CTC TCT AGT AGA CAA TCC CGT GCT AAA TAT ACC AGC ATC GTC TTG ATG CCC TTG GCA GTA AAT GCC TAA CGA CTA TCC CTT, Th5P6 GCC TGA GTA TAA GGT GAC TTA TAC TTG TAA TCT ATC TAA ACG GGG AAC CTC TCT AGT AGA CAA TCC CGT ATA CCA GCA TCG TCT TGA TGC CCT TGG CAG CTA ACG ACT ATC CCT T, Th6P6 GCC TGA GTA TAA GGT GAC TTA TAC TTG TAA TCT ATC TAA ACG GGG AAC CTC TCT AGT AGA CAA TCC CGT GAT ACC AGC ATC GTC TTG ATG CCC TTG GCA GCC TAA CGA CTA TCC CTT, Th1P5 TGA GTA TAA GGT GAC TTA TAC TAG TAA TCT ATC TAA ACG GGG AAC CTC TAT ACC AGC ATC GTC TTG ATG CCC TTG GCA GAG ACA ATC CCG TGC TAA ATT GTA GGA CTG CCC GGG TTC TAC ATA AAT GCC TAA CGA CTA TCC CTT, Th2P5 TGA GTA TAA GGT GAC TTA TAC TAG TAA TCT ATC TAA ACG GGG AAC CTA TAC CAG CAT CGT CTT GAT GCC CTT GGC AGA CAA TCC CGT GCT AAA TTG TAG GAC TGC CCG GGT TCT ACA TAA ATG CCT AAC GAC TAT CCC TT, 3Mex2P6 GTA ATC TAT CTA AAC GGG GAA CCT CTC TAG TAG ACA ATC CCG TGC TAA ATT GAT ACC AGC ATC GTC TTG ATG CCA TTG GCA GCA TAA ATG CCT AAC GAC TAT CCC TT, and Th2P6.D GTA ATC TAT CTA AAC GGG GAA CCT CTC TAG TAG ACA ATC CCG TGC TAA ATT GAT ACC AGC ATC GTC TTG ATG CCC TTG GTT GCA TAA ATG CCT AAC GAC TAT CCC TT. The introns were PCR-amplified with KM37 (GAT AAT ACG ACT CAC TAT AAT GGC ATT ACC GCC TTG T) and GM24 (GCT CTA GAC TTA GCT ACA ATA TGA AC) in 25 μl reactions under the conditions stated above and cycled 20 times. A portion of the reaction (5 μl) was run on a 3% agarose gel and the PCR product band was stabbed with a pipette tip. The agarose plug was added to a fresh PCR reaction (100 μl) and cycled 15 times; DNA was purified using a QIAquick kit and quantitated. The PCR product (2 μg in 50 μl) was added to an in vitro transcription reaction containing Ampliscribe T7 RNA polymerase (Epicentre), RNase inhibitor (GIBCO BRL, Rockville, MD; 5 units), low Mg2+ buffer (30 mM Tris-HCl, pH 8, 7.5 mM DTT, 4.5 mM MgCl2, 1.5 mM spermidine), UTP (1.25 mM), ATP (2.5 mM), GTP (2.5 mM), CTP (7.5 mM) and α-32P UTP (NEN, Boston, MA; 20 μCi; 3000 mCi/mmol), and incubated at 37°C for 2 hours. DNase (GIBCO BRL, 295 units) was added and the reaction was incubated at 37°C for an additional 30 minutes. The RNA was purified using Centri-Sep columns (Princeton Separations, Adelphia, NJ) and quantitated. The assays were performed by heating the RNA (500 nM) in H2O to 70°C for 3 minutes then transferring to ice for 1 minute. Splicing buffer (20 mM Tris-HCl, pH 7.5, 100 mM KCl, 3 mM MgCl2), effector (theophylline, 1.5 mM) was added and the reactions were incubated on ice for an additional 15 minutes. At this time a 4.5 μl aliquot was removed for a zero time point and quenched with 5 μl stop dye (95% formamide, 20 mM EDTA, 0.5% xylene cyanol, and 0.5% bromophenol blue). GTP (50 μM) was added to the remaining reaction (5 μl total volume) to start the splicing reaction. The reaction was incubated at 37°C for 30 minutes and then terminated with stop dye (5 μl). The reactions were heated to 70°C for 3 minutes and 5 μl was analyzed on a 8% denaturing polyacrylamide gel. The gel was dried, exposed to a phosphor screen and analyzed using a Molecular Dynamics Phosphorimager (Sunnyvale, CA). The plotted data and rate constants for Th1P5 and Th2P6 constructs are shown in Figures 2b and 2c and Table 2. The changes in the extent of reaction observed between individual experiments, and thus the attendant error bars, were consistent with those observed during the kinetic analyses of other ribozymes. For example, studies of the hairpin ribozyme have shown that data points can vary between individual experiments by as much as 50% . Our data points typically varied from one another by less than 30%. The plasmids containing the various group I constructs were transformed into competent C600ThyA::KanR cells and grown in LB with kanamycin overnight. A small aliquot (3 μl) of overnight cell culture was mixed with effector (theophylline, 7.5 mM) or H2O, spotted on plates, and grown overnight at 37°C. As a positive control, all constructs were also plated on minimal media plates with thymine (MMT) and assayed for viability. Cells grown overnight in LB were diluted 1:100 in MM containing either theophylline, caffeine, 3-methylxanthine or no effector, and analyzed on a Microbiology Workstation Bioscreen C (Labsystems, Inc., Franklin, MA). RNA was isolated from an overnight culture using a MasterPure RNA purification kit (Epicentre, Madison, WI) and amplified by RT-PCR using primers KM37 and GM24 following the protocol provided for Tth polymerase. The products were separated and analyzed on a 3% agarose gel. This work was funded by the Office of Naval Research (Grant #: N00014-99-1-0861), the Defense Advanced Research Projects Agency (Grant #: DAAD19-99-1-0207), and the National Institutes of Health (Grant #: 1R01 GM61789-01). We would like to thank Ken Johnson for assistance with kinetic analyses. Kristin M. Thompson conceived of, designed, and carried out most of the experiments described in this paper and analyzed the resultant data. Heather A. Syrett repeated a number of these experiments and showed that the in vivo activation of the intron was reproducible. Scott M. Knudsen assisted in data analysis. Andrew D. Ellington conceived of these experiments and assisted in the design of experiments and data analysis.